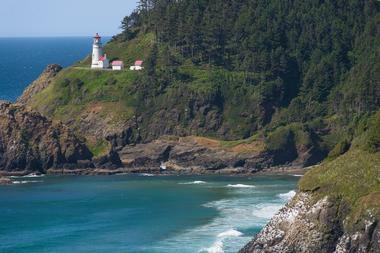 The Oregon Coast is home to some of the most fantastic views in the United States. From rolling sand dunes to towering sea stacks, Oregon's coastline continually captures the imagination of locals and visitors alike. 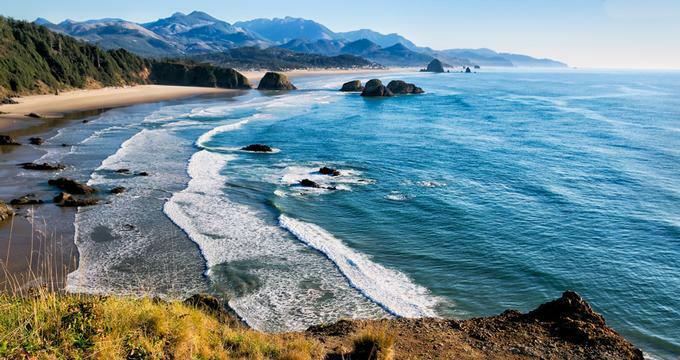 Roughly 235 miles of the coastline is comprised of sandy beaches, including Cannon Beach, Clatsop Spit, Harris Beach State Park, Oceanside, Oregon Dunes National Recreation Area and many others. 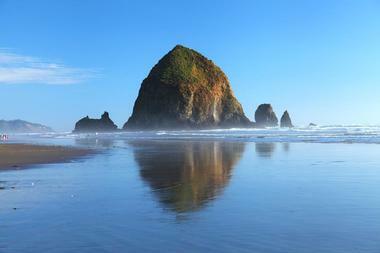 Here are the best Oregon beaches. 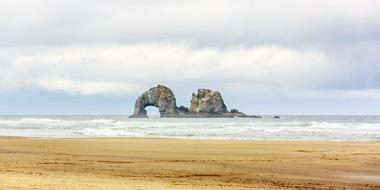 Cannon Beach is home to Haystack Rock, one of Oregon's most well known landmarks. The monolith stands about 235 feet back from the shoreline of Cannon Beach, and at low tide, it is easy to get a close look at the impressive rock tower. Colorful sea stars, crabs, and anemones cling to the base of Haystack Rock, and puffins perch on the landmark from early spring to mid-summer. The famous rock is protected as part of the Oregon Islands National Wildlife Refuge area. 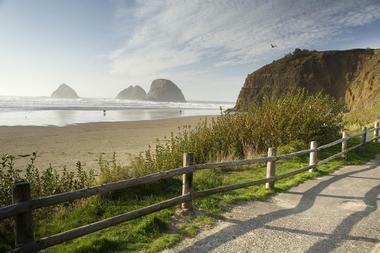 Tourists can admire Haystack Rock, Cannon Beach, and other nearby attractions year-round. Cape Perpetua Scenic Area is located three miles away from Yachats, Oregon. Cape Perpetua is known for its captivating views of the Pacific Ocean, the miles of headlands that stretch down the Oregon coast, and the majestic forest that surrounds the tranquil area. One of the best views of the coastline is found at the Cape Perpetua Visitor Center, a building equipped with a wraparound observation deck that is open most days of the year. In the summer months, the center is staffed with guides who lead interpretive programs and short tours. Guests can purchase souvenirs and guidebooks at the onsite bookstore throughout the year. Carl G. Washburne Memorial State Park sits on the east side of Highway 101. Separated from the highway by plants and trees, the park provides plenty of spots for tent and RV camping. Apart from two yurts, each campsite on the property is filled on a first come first served basis. The campsite has showers, flushing toilets, and other useful amenities. Campers can follow the walking paths in Washburne Park to see Heceta Head Lighthouse and the remote beach that surrounds it. 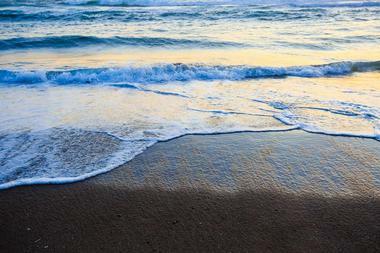 The five-mile-long beach is an optimal place for whale watching, beachcombing, and picnicking. Clatsop Spit is a popular destination among clam diggers. 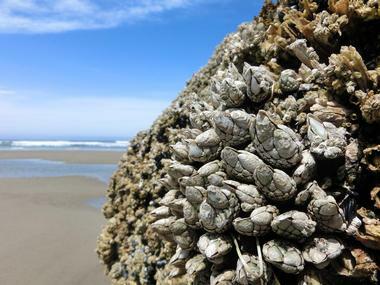 The 18-mile stretch of beach is home to thousands of razor clams that tend to vary in size and shape according to where they live on the spit. Local clamming enthusiasts hold clam digs and clinics throughout the year. Clatsop Spit also boasts a 4.6-mile loop hike that is suitable for hikers of all ages. During the hike, visitors can spot brown pelicans, Caspian terns, double-crested cormorants, and other types of fowl. At Point Adams hikers can see the area where Lewis and Clark camped with the Corps of Discovery in the early 1800s. 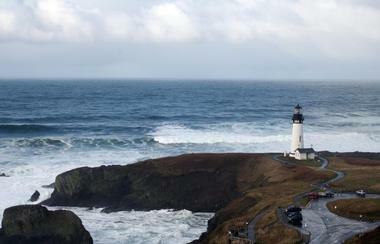 The Yaquina Head Outstanding Natural Area is a beautiful stretch of coastline that boasts a majestic basalt headland. Oregon's tallest lighthouse, which has guided ships in the region to safety since the late 1870s, sits on top of the rugged cliff. Cobble Beach sits below the headland. Here, visitors can see tide pools that are filled with all types of sea creatures as well as millions of interesting basalt rocks. On the offshore islands, travelers can view thousands of nesting sea birds and harbor seals. Migrating gray whales can be seen from Cobble Beach at different times of the year. 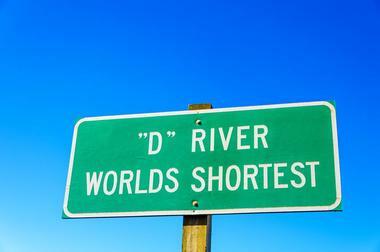 D River is known as the shortest river in the world. The 120-foot-long body of water runs from Devils Lake into the tumultuous Pacific Ocean. Surrounded by a wide, sandy beach, the D River Wayside is a popular area for fishing, swimming, beachcombing, and picnicking. The beach is frequently the site of numerous festivals, including the world's two largest kite festivals, which take place in June and October. The Finders Keepers search, where people leave handmade glass floats for others to find along 7.5 miles of the D River beach, is another popular event in the area. The beach is open for visitors year-round. Named after the Scottish pioneer George Harris, Harris Beach State Park is home to Bird Island, the largest island off of the Oregon coast. Bird Island is a National Wildlife Sanctuary and breeding ground for a variety of coastal fowl. 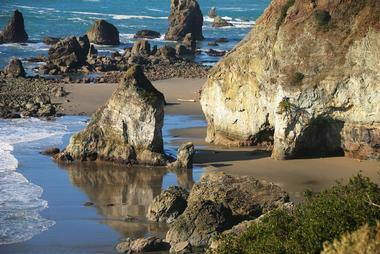 Harris Beach State Park offers plenty of space for tent and RV camping. There are six yurts on-site as well as flushing toilets, hot water showers, and an RV dump station. 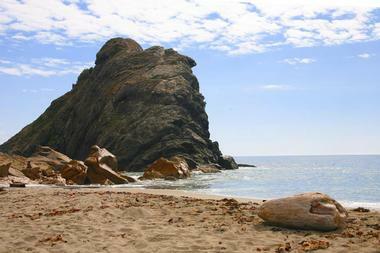 Harris Beach State Park attracts visitors year-round. Travelers come to see coastal dramatic storms in the wintertime and return in the summer to enjoy dry, warm days. The beach teems with life in the spring and acts as a stage for incredible sunsets in the fall months. Heceta Head Lighthouse State Scenic Viewpoint sits at the mouth of Cape Creek. The viewpoint is connected to the Heceta Head Lighthouse by a short walking path that is part of a 7-mile-long trail network in the Heceta Head area. Along these trails, visitors can enjoy stunning ocean views and see scores of cormorants, gulls, and other seabirds that nest on offshore islands. The lighthouse, which sits atop the 1,000-foot-tall Heceta Head, is one of the most photographed spots on the Oregon Coast. The nearby keeper's house is available to rent for overnight stays as well as special events. Located within the Oregon National Recreation Area, Horsfall Beach is a seemingly endless white-sand beach that is filled with 47 miles of rolling dunes and scenic wetland areas. Popular activities at Horsfall Beach include surf fishing, off-road vehicle riding, horseback riding, and hiking. 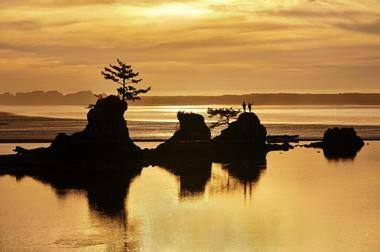 Overnight visitors can camp in the designated campground two miles away from Coos Bay. 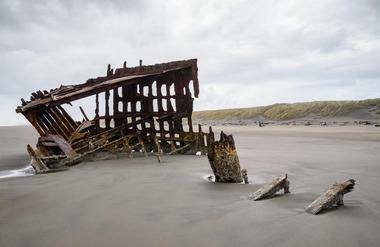 During the winter months, storms uncover ancient shipwrecks that have sat untouched on the coast for many years, and in the summer, Horsfall Beach is perfect for sunbathing, beachcombing, and swimming. Horsfall Beach is easily accessible from U.S. 101 North. Lincoln City is a hot spot for adventure seekers and families. In addition to typical city attractions, Lincoln City boasts a pristine 685-acre beach, a protected bay, and plenty of areas for hiking, wildlife viewing, and other kinds of sports. The beach is popular among surfers and crabbers, while Devils Lake and Siletz Bay attract birdwatchers and boaters. Manzanita is one of three quaint villages located next to the Pacific Ocean on the North Oregon Coast. 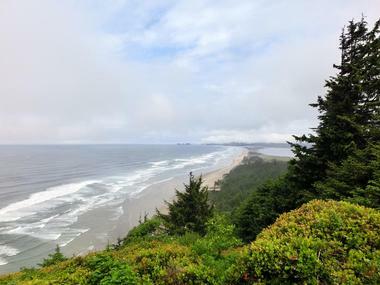 Known for its seven miles of untouched beach, Manzanita is located close to Nehalem Bay State Park, a beautiful sanctuary that sits atop a four-mile-long sand spit. The park contains a large campground with 285 spots for RVs, 17 primitive horse camping sites, 18 yurts, and plenty of amenities. Campground guests enjoy easy access to the beach and the 1.8-mile-long bike path that winds around the bay. The Nehalem Bay area offers plenty of space for sunbathing, beachcombing, walking, jogging, and more. Meyers Beach has been deemed one of the most beautiful beaches in the world. Often used as a film site for commercials and other productions, Meyers Beach features a cluster of sea stacks that are fun to visit during low tide. Some of the sea stacks even have tunnels that are easy to explore on foot. Since the bay around Meyers Beach is shallow, it is a prime spot for surfing, windsurfing, and other high-adrenaline watersports. At sunset and sunrise, photographers spread out along the sand to get the best possible shots of this stunning place. Meyers Beach is located about 14 miles south of Gold Beach. Moolack Beach is a long, desolate stretch of sand that juts out into the Pacific Ocean. The 5-mile-long beach sits close to Beverly Beach State Park, a popular spot for RV and tent camping. Two large cities, Newport and Lincoln City, are located close to Moolack, and other nearby attractions include the Yaquina Head Lighthouse, Beverly Beach, and Devils Punch Bowl State Natural Area. Surfers, wildlife and bird watchers, and beachcombers often come to Moolack Beach to enjoy its solitude and good surfing conditions. The beach is easy to reach from US Highway 101. 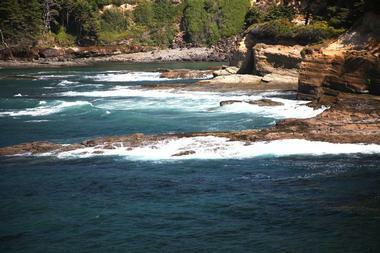 Visitors can access Neptune State Scenic Viewpoint from four separate pull off areas along US Highway 101. The first pull off is situated next to Gwynn Creek, which is surrounded by a grassy area for picnicking as well as a small beach. At the second stop, Neptune, visitors can see Cummins Creek as well as the Pacific Ocean. This stop is popular for whale watchers and wildlife spotters. Stop number three is called Strawberry Hill. Ocean views, tide pools, beaches, and seals are some of the main draws at this pull off point. The last pull off point, Bob Creek, connects to a long, sandy beach. 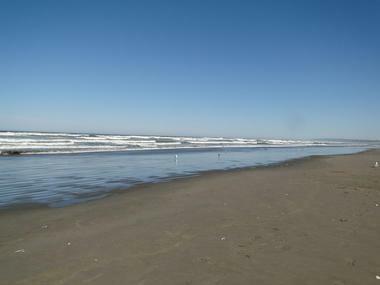 As one of the most popular destinations in the Newport area, Nye Beach attracts scores of locals and tourists each day. The beach sits next to the eclectic Nye Beach neighborhood and is surrounded by shops, cafes, restaurants, and other attractions. Oceanside is a favorite spot among agate hunters, beachcombers, surfers, and fishing enthusiasts. The long and quiet beach is located below the clifftop community of Oceanside. Three Arches National Wildlife Refuge, the first National Wildlife Refuge set up west of the Mississippi River, is just half a mile away from this peaceful beach. The refuge protects tufted puffins, murres, and other unique creatures. In Oceanside village visitors can grab coffee at the local cafe or visit some of the shops near the beach. Oregon Dunes National Recreation Area is a breathtakingly picturesque destination along the Oregon Coast. This 40-mile stretch of towering sand dunes along the beach provides ample opportunities for outdoor fun. Some of the many activities people enjoy here include hiking, fishing, kayaking, horseback riding, camping, and beachcombing. Oregon Dunes is particularly popular among off-roaders, who come in droves with dirt bikes, quads, and buggies. More than 30 lakes and ponds are scattered throughout Oregon Dunes, and hikers can find a long network of beautiful trails in the nearby coastal forest. There is plenty of space for tent camping, RV camping, and sleeping under the stars. 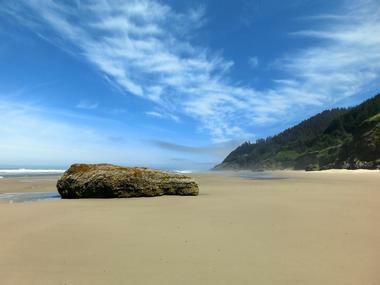 Oswald West State Park is home to a desolate white sand beach that extends for four miles along the coast. Hikers, surfers, beachcombers, and fishing enthusiasts will find lots of entertainment at this peaceful park. In the nearby forest there are miles of trails that offer amazing views of the Pacific Ocean. Short Sand Beach, known locally as Shorty's, is famous for its interesting sandstone cliffs and basalt columns. 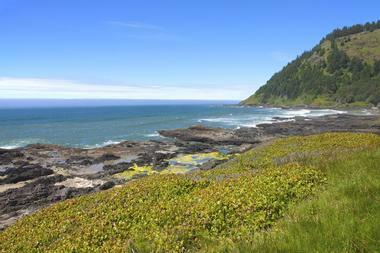 For stellar views of the coastline, visitors can drive to Cape Falcon and Neahkahnie Mountain. Both attractions are located within the 2,500-acre park. Lastly, visitors should take a look at the well-preserved coastal rainforest inside of Oswald West State Park, which is considered to be one of the best coastal forests in the world. Pacific City boasts three different beach access points. At Bob Straub Park, visitors can walk along the Big Nestucca Spit, and at the beach access point near the end of Pacific Avenue, adventure seekers can bring off-roading vehicles for some fun on the dunes. Most visitors flock to the access point at Cape Kiwanda Park, which offers plenty of parking and amenities. 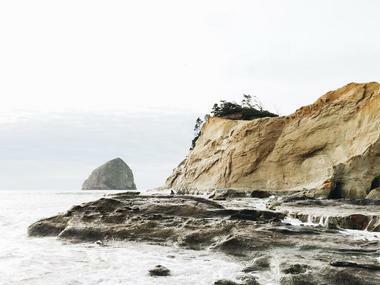 At the Cape Kiwanda Marine Gardens, travelers can check out beautiful sandstone formations as well as tidal pools that are filled with sea life. Overall, Pacific City is a top destination for beachcombing, kayaking, bird watching, crabbing, and all sorts of other outdoor activities. Known for its family-friendly atmosphere, Rockaway Beach is a long gold-sand beach along a beautiful stretch of the Oregon Coast. Beachcombers enjoy taking walks next to the Pacific Ocean while searching for shells and smoothed-down glass fragments. It is also possible to spot Japanese glass floats that have washed up on the beach after spending up to 10 years at sea. In rocky areas, visitors can check out the tide pools that teem with animal and plant life. Lastly, there are areas close to Rockaway Beach that are ideal for fishing, hiking, kite flying, and bird watching. 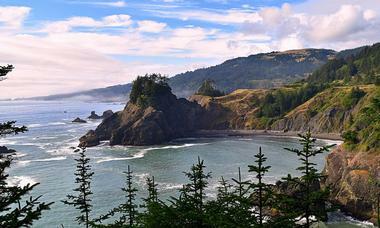 The Samuel H. Boardman State Scenic Corridor is a 12-mile-long ribbon of coastline. Filled with steep cliffs, sandy beaches and coastal forest areas, the corridor is known for its unparalleled beauty. As the namesake of Oregon's first parks superintendent the corridor is carefully preserved and managed. Some of its best features include the 300-year-old sitka spruce trees in the forest, the monolith known as Arch Rock, and the 27-mile-long portion of the Oregon Coast Trail that winds through the corridor. From the desolate beaches, visitors can take in stunning views of ancient sea stacks, hidden coves and steep, forested cliffs. This 25-million-year-old cave system is home to hundreds of sea lions. Stretching the length of a football field, the caves act as a sea lion breeding ground during the fall and winter months. The area is meticulously managed to ensure that the sea lions are kept safe all throughout the year. In addition to sea lions, the caves host all sorts of colorful lichens and algae. 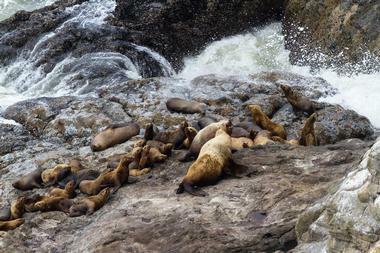 Sea Lion Caves sits 11 miles outside of Florence, Oregon, near milepost sign 179.1. There is a visitor's center where guests can learn all about the inhabitants of the caves as well as a gift shop for picking up unique souvenirs. Seaside, Oregon is a popular beachside town on a picturesque stretch of the Oregon Coast. Touted as the play capital of Oregon, Seaside offers plenty of space for hiking, biking, kayaking, surfing, and other fun activities. In the city, visitors will find ample opportunities for shopping, dining, and entertainment. Seaside is known for holding fun and family-oriented events all throughout the year, so travelers will undoubtedly get the chance to experience an authentic Seaside get-together during their stay. Thanks to its central location, Seaside is a great jumping-off point for seeing the best that the Oregon Coast has to offer. Siletz Bay National Wildlife Refuge is a scenic estuary area just south of Lincoln City. The 500-acre refuge is part of an ongoing project to protect Oregon's most fragile wildlife. The refuge is not accessible to tourists, but visitors can get spectacular views of the unique birds in the area from Highway 101. Red tailed hawks, bald eagles, and other types of fowl nest in the protected uplands and wetlands. Travelers can also spot Aleutian and dusky Canada geese, peregrine falcons, and bald eagles. The waters in the estuary are home to Chinook and Coho salmon and cutthroat trout. 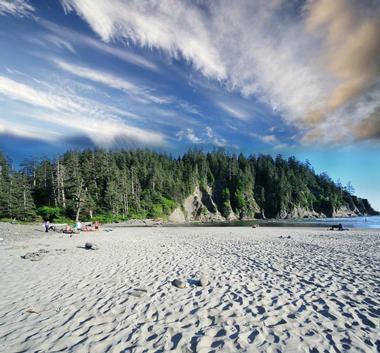 Celebrated as one of the most scenic areas along the Oregon Coast, Sunset Bay State Park features a spacious campground that can accommodate tents, campers, and RVs. The campground also holds eight yurts and two spots for large tent camping groups. Flushing toilets and hot showers are available for all who stay at the campground. The beach is just a short walk away, and trails that surround the campground give guests incredible views of Oregon's rugged coastline. Gregory Point and Cape Arago lighthouse are also visible from different points along the trails. Other attractions near Sunset Bay State Park include a golf course and the cozy fishing village of Charleston.